THE BIRTHPLACE OF MAJOR GENERAL J.E.B. STUART C.S.A. The tranquil and beautiful place known as Laurel Hill, is nestled beneath the Blue Ridge mountains of south- western Virginia in Patrick County. In the words of General Stuart in a letter to his brother William Alexander in 1863 "I would give anything to make a pilgrimage to the old place, and when the war is over quietly spend the rest of my days there." Tragically, on May 12th, 1864 his dream of returning to Laurel Hill ended with his death as a result of the wound he received during the engagement at Yellow Tavern the previous day. Laurel Hill is located seven miles north of the city of Mt. 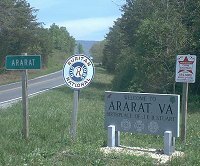 Airy, North Carolina, less than a mile beyond the Virginia-North Carolina border in Ararat, Virginia. Laurel Hill is owned and Maintained by the J.E.B. Stuart Birthplace Preservations Trust Inc. and welcomes visitors during daylight hours, each day of the week. Information for a self-guided walking tour is provided near the entrance to the property. The exact date that Archibald and Elizabeth Stuart decided to commence construction of their new home is not known, however, from the available evidence it began sometime during the middle of the third decade of the nineteenth century. 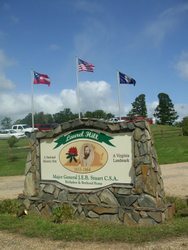 Seven of the eleven children born to Archibald and Elizabeth were born here at Laurel Hill including James Ewell Brown Stuart who would, in later life, become one of the most celebrated heroes in the cause of Southern Independence. A fire in the winter of 1847-48 destroyed the family home and it was never rebuilt. With the death of Archibald Stuart in 1855, Mrs. Stuart retained the property until 1859 when she sold it to two Mt.Airy, North Carolina men. Subsequently, the once vast fifteen hundred acre parcel was sold and sub-divided down through the years. In the early 1990's a non-profit trust was founded that was able to purchase the seventy-one acre tract that contained all of the remainders of the Stuart occupancy. Immediately across the Ararat River which forms the western boundary of present day Laurel Hill, is the grave of William Letcher the great-grandfather of J.E.B. Stuart. This is the oldest marked grave in Patrick County and is owned and maintained by the Trust. William and his wife Elizabeth came to this location in 1778 at the height of the American Revolution. 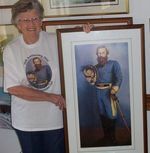 He was a staunch supporter of the Revolution and a member of the local militia. The surrounding area contained and supported many Tories, who remained loyal to the monarchy of England. On a fateful day in 1780, Mr. Letcher was killed by a Tory by the name of "Nichols." Their only child, Bethenia, born in 1780 was later married in late 1799 or early 1800 to David Pannill. This union produced a son named William and a daughter named Elizabeth who later became the mother of General Stuart. Laurel Hill was placed on both the Virginia Landmarks Register and the National Register of Historic Places in 1998.